Released to coincide with the CD reissues of his first four solo albums in 2001, Modern Art follow's Foxx's musical evolution from the stark electronica of his debut Metamatic, to the warmth of In Mysterious Ways and beyond. After presenting each of Foxx’s single releases between 1980 and 1985, Modern Art leaps through a 12 year ‘silence’, to Foxx's 1997 'revival' with the Shifting City and Cathedral Oceans albums in the mid 1990s. Modern Art features remastered versions of all the single mixes, plus “My Face”, a track only previously available as a flexi-disc record from Smash Hits magazine in 1980. It also gives a taste of things to come with "Nightlife" from 2001’s The Pleasures of Electricity, which sees John going back to a darker, more minimalistic electro sound. 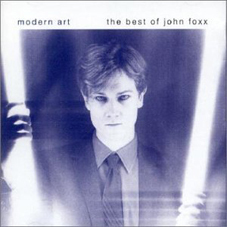 Modern Art provided for me, the perfect introduction to the music of John Foxx.